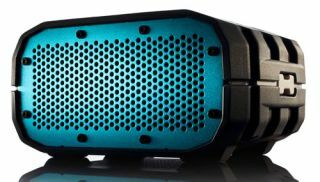 Braven introduces the rugged, water-resistant wireless BRV-1 speaker | What Hi-Fi? Designed to withstand use in the great outdoors, the Braven BRV-1 wireless portable speaker is IPX5-certified water resistant and is housed in a rugged case to withstand bumps and knocks. With 12 hours of playback from the 1400mAh battery, the 6W speaker wirelessly streams music from a smartphone, tablet or computer via Bluetooth. There's also a 3.5mm jack for connecting non-Bluetooth devices. A built-in 'power bank' can charge your phone on your travels, plus a noise-cancelling mic for making and taking calls from your phone. To achieve its IPX5 certification – a rating that officially means “water projected by a nozzle (6.3 mm) against enclosure from any direction shall have no harmful effects” – the Braven BRV-1 survived 12.5 litres of water per minute being hosed on it at 30kPA pressure from a distance of 3m. "In real life, that means the BRV-1 is happy being out in the rain or snow, being sprayed by water on the beach or in the bathroom, or getting muddy out biking," claims Braven. The BRV-1 is available in two colours – the blue-faced Glacier (pictured above) and orange-trimmed Lava. Both cost £149.99.